Noun 1. el·e·va·tor pitch: A brief description of an idea, a service, product or a person that covers all of its aspects, and is delivered within a few seconds (the approximate duration of an elevator ride). Whether you are an entrepreneur at a 'meet and greet' during a conference, or you are out with friends who are connected to somebody who knows somebody... having a concise and impactful statement "in the can" will allow you to take advantage of an opportunity that could potentially take your business to a whole new dimension. It is important to understand this distinction: you are NOT necessarily selling your business. 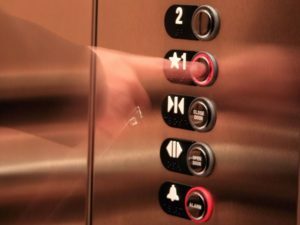 Consider that a good elevator pitch is like a “teaser” leaving people wanting to know more about you and your business. In a 2 hour coaching session, I guarantee you will come away with an elevator pitch lasting 30 seconds AND that you will feel comfortable and confident with the result. This will include developing your “message”, practice, putting it on its feet, filming and immediate feedback.